This mountain represents the mountains in our lives. There are mountains that we have to climb, and as long as we are with Jesus, and we put him in charge of our lives, he will help us over the mountains. When we surrender our hearts to the Master, the giver of life, and give him full control of our lives, he will be our helper. When we put our faith, and our trust in him, the Lord will be our shield from the storms. Jesus told his disciples: “…If ye have faith as a grain of mustard seed, ye shall say unto this mountain, Remove hence to yonder place; and it shall be removed; and nothing shall be impossible unto you.” Matthew 17:20. 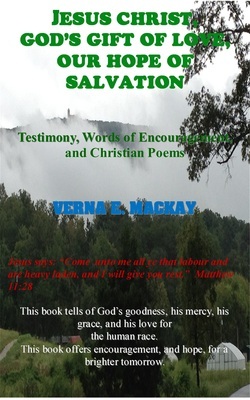 This book speaks of God’s goodness, his mercy, his grace, and his love for the human race. God is kind, faithful, and wonderful in all situations. Gods’ love for us goes far beyond what we can understand. Between the pages of this book, the reader will find encouragement, and hope for a brighter tomorrow. Are you facing difficult challenges in your life? Do you have questions about faith, and why God sometimes seem far away? Does God really hears, and answers prayers? What are some of the signs that Jesus is coming back soon? Is there hope beyond this present world? Is heaven a real place? This book seeks to answer these questions directly, from the word of God, the Holy Bible. Personal testimonies tell of how God saved the lives of the author of this book, and her children, when they were involved in a terrible auto accident. There are poems that will be a blessing to the reader. “Let us hear the conclusion of the whole matter: Fear God, and keep his commandments: for this is the whole duty of man.” Ecclesiastes 12:13. ﻿This book is available on line, at:﻿ https://www.createspace.com/4619003. ﻿Click on ﻿﻿﻿“Add to Cart.” ﻿ ﻿Cost $18.00 plus shipping and handling. Taxes may apply. Questions: Contact Createspace at: 206-922-0860. If you have a Facebook account, please send me a Friend request. Send me a message on Facebook, and make mention of book, and website in message. Thanks for ordering. Have a great day. Scroll down to see additional books. https://www.createspace.com/5152558; https://www.kindle.com for the iPhone, iPads, Tablets and other digital devises. Please fill out the comment section of this webpage. Look forward to hearing from you. Please follow me on Twitter at https://twitter.com/Verna635. Picture of Tabatha, the lost kitten that is mentioned in the book. I prayed and the Lord answered my prayer. This is the most miserable cat I have ever seen. She never seems to stop whining. I find myself hiding from her, because she pesters me. 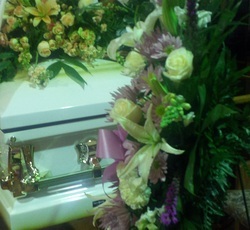 In heaven, and in the earth made new, there will be no more death, no more funerals to attend. Loved ones will never, ever be separated again. Death is an enemy, that will one day be destroyed by Jesus. O, death, where is thy sting? O, grave where is thy victory? 1 Corinthians 15:55. The cross in the middle belonged to you, and me. Jesus died on the cross, so that we may have eternal life. He rose on the first day of the week, went back to heaven, where he is interceding for you and me. Thank God that Jesus is my Savior, my Redeemer, my Lord, my friend. He is King of Kings, and Lord of Lords. Jesus is worthy to receive praise, glory, and honor. May his name be glorified throughout the entire world. Here are some of the things you will not see in heaven, or in the new earth. We will no longer need them. Praising God, always. In this accident, of these two vehicles, no one was seriously injured. One person was taken to the hospital, and the lady in the silver vehicle, came out of the vehicle on her own. She had a few scratches on her. One driver was on the cell phone, and did not stop at the stop sign, causing the accident. The truck landed on a fire hydrant. God is a merciful God. This is a book for such a time as these. In these closing days of earth's history, prayer is the Christians life line to heaven. It brings you closer to the great King of the universe who never gets tired of hearing from you. Prayer is the Christian’s lifeline to the throne room of God. It is through prayer, that the repentant sinner finds forgiveness of sins, mercy, and, grace from the hands of the Almighty, powerful, wonderful, loving God. God always has his arms out stretched to receive the sinner, and grants pardon. Because of sin, we are no longer able to see God and to speak with him face to face. Adam and Eve were able to speak with God face to face. Moses wanted to see God’s glory, and this is what God said to him, “…Thou canst not see my face: for there shall no man see me, and live.” Exodus 33:20. REMINDER: Books are available at https://www.createspace.com/5152558; https://www.kindle.com for the iPhone, iPads, Tablets and other digital devises. Please fill out the comment section of this webpage. This book seeks to unmask some of Satan’s deceptions, and to reveal the truths directly from the word of God, the Holy Bible. It includes topics on the state of the dead, how to study the bible, evolution, once saved always saved, the secret rapture. God extends his amazing grace to the world. This is a workbook. At the end of each topic, there are reflections and activities for the reader to do. There are people who proclaim to be Christians who are not a part of the true followers of Jesus Christ. The bible calls them wolves living among the sheep. The wolves represent the disciples of Satan while the sheep represents the children or followers of the Lord. This book gives examples of wolves and sheep. The Lord wants everyone saved into his kingdom, but there are those will reject the free offer of salvation, and will be eternally lost. This book takes the readers using their imagination into the homecoming of Jesus into heaven after his resurrection from the grave, the response from the holy angels as they welcome their Commander and Chief Jesus Christ. This book offers those who have surrendered their lives to the Lord a glimpse of what heaven will be like for them when they finally get there, and of the New Jerusalem.